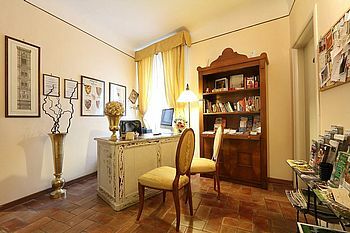 Relais il Campanile al Duomo is located on the first floor (no elevator) in a historic building in the center of Florence, overlooking one of the most characteristic streets of the city, is the ideal destination for your stay in Florence. Warm and comfortable with an elegance that is never obvious, bright and quiet, it will contribute to the unforgettable fascinating atmosphere that only Florence can give to its visitors. Relais il Campanile al Duomo is ideally located. It is in walking distance from all the main city monuments : the Duomo (Cathedral) at the end of the street ; the Accademia (the Academy) housing Michelangelo's famous "David"; a stone's throw away is the world famous Ponte Vecchio and the Uffizi Gallery. 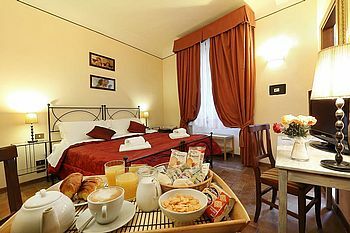 A rich Italian breakfast will be served in your room, thus providing a special, exclusive service making your stay even more comfortable. Our staff will be happy to help suggest itineraries, ideal stops to make, typical restaurants and lots of tips on Florence and Tuscany.